Everyone knows what their perfect cookies is like. Some will want their cookie soft, some will want it crispy, some will want it chewy, some will want it sticky… And some will want a combination of a few characteristics, like soft and sticky or crispy and chewy. What’s yours? For me, I have cravings for different cookies at different times. Most of the time I like cookies that are soft and chewy, like those Subway cookies. But there are also times when I want a cookie that is crispy in the exterior, but still a little chewy and sticky in the centre. I recently watched a cooking show by Anna Olsen and she mentioned that the key to getting a cookie that has a crispy exterior but soft centre is to add in corn starch. So I decided to try it out on Nigella’s recipe. One batch is made according to Nigella’s recipe while the other batch is made by substituting a little plain flour for corn starch. And after baking them, I do find that the one with corn flour makes a slightly softer, and little bit more chewier cookie. The one using all plain flour is a little bit more crumbly. But to be honest, the difference is very minimal, and I think most people won’t be able to tell the difference. But since I like the softer and chewier version, I will be sharing the cornflour recipe instead! 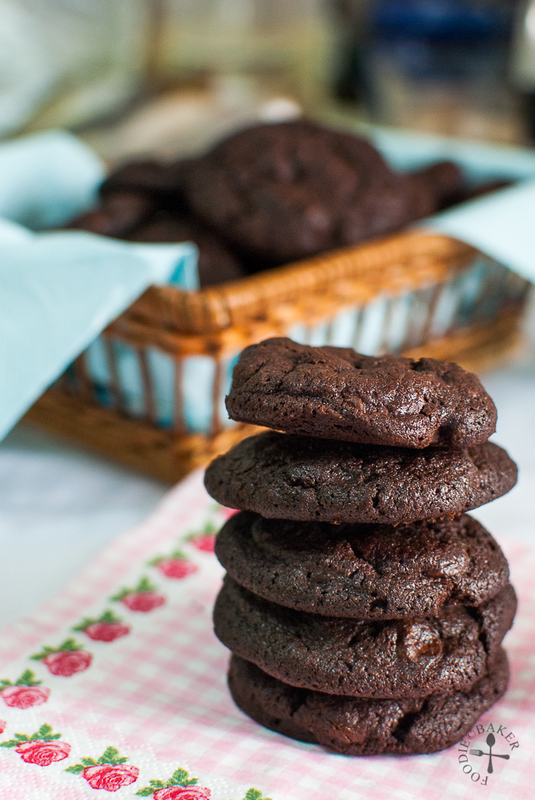 Regardless of the texture, these cookies are so chocolatey delicious! Use only good-quality chocolate as it really makes a difference. The chocolate chips I used (Margaret River (a gift from a friend, thank you!) and Ghirardelli) remained oozy even after the cookies have cooled, and I just feel so excited when I see the oozy chocolate chips inside the cookie. When the cookie jar is opened, the chocolatey aroma waft through the air and past my nose, and my hand will automatically reach for a cookie and put it in my mouth. And the worse/best (I can’t decide) is, I can’t stop at one! I wish I can send you all some cookies or send you all the smell of how chocolatey these cookies are, but I can’t, so make them at home now! Here’s how! 1) Measure some good dark chocolate 2) Melt them - smooth and good! 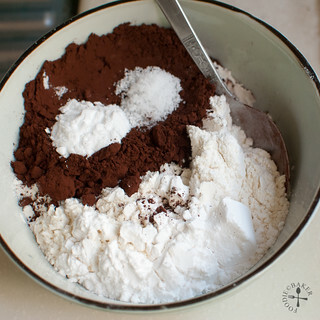 3) Measure the dry ingredients. 4) Whisk or sift to remove lumps. 5) Cream the butter and sugars. 6) Then egg and vanilla joins the fun. 7) Followed by the cooled melted chocolate. 8) Dump in the flour mixture. 9) How can we forget the chocolate chips? 10) Scoop, roll, refrigerate then bake! If only I have a glass of soymilk (I don’t drink milk oops!) to go with these cookies! 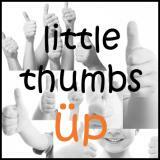 I’m also going to submit this to Little Thumbs Up organised by Doreen from my little favourite DIY and Zoe from Bake for Happy Kids. This month’s theme – Egg – is hosted by Yen from Eat your heart out. The recipes are all linked at this post HERE! Line a baking sheet with baking parchment. Set aside. Chop the dark chocolate and place it in a heatproof / microwave-safe bowl. 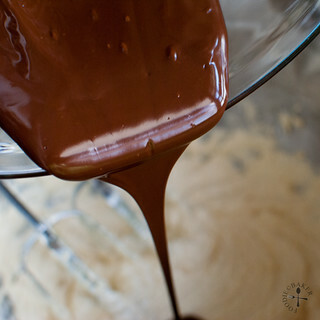 Melt the chocolate over a double boiler or in a microwave. Set aside to cool. 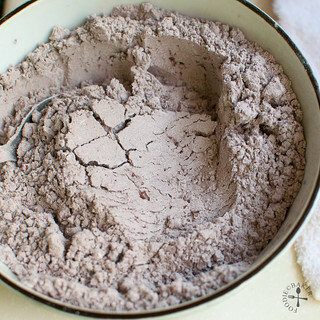 Measure the flour, cocoa powder, corn starch, baking soda and salt in a small bowl. Whisk or sift to remove lumps. Set aside. 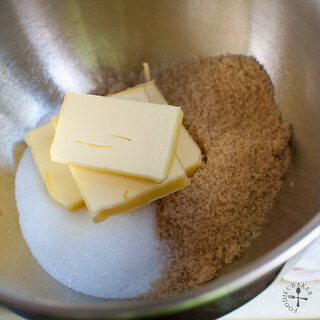 Place the butter, brown sugar and caster sugar in a large mixing bowl. Beat with an electric mixer (or by hand if you are up to it) on medium-high speed until pale in colour, light and creamy - about 5 minutes. Beat in the egg and vanilla, another 1 minute on medium speed. Scrape in the melted chocolate and beat until fully incorporated. Add in the flour mixture and beat on low speed until incorporated. 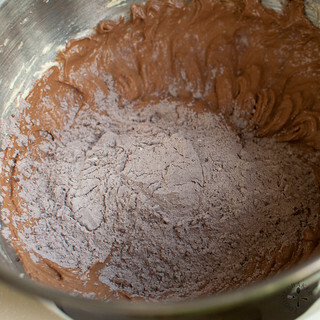 Use a spatula and scrape the bottom of the mixing bowl a few times to ensure the batter is well-mixed together. Stir in the chocolate chips. 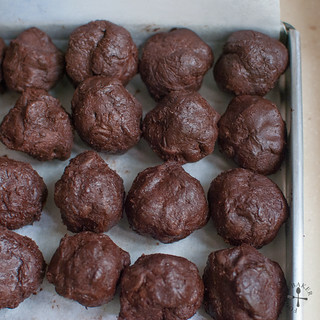 Scoop a heaping tablespoon of cookie dough, roll it into a ball and place it on the lined baking sheet. They don't have to be placed far apart as you are going to refrigerate them first. Refrigerate the cookie dough for 1 hour until firm. Space the cookie dough about 2 inches apart from one another and bake them, straight from the refrigerator and no need to flatten, for 15 to 18 minutes. Place the baking sheet on a wire rack and let the cookies cool completely before storing them in an air-tight container for up to 1 week. Use the best quality chocolate you can find for this recipe! I used Margaret River’s dark chocolate chips and Ghirardelli’s semisweet chocolate chips and it’s really awesome because the chips remained oozy even after the cookies have cooled. 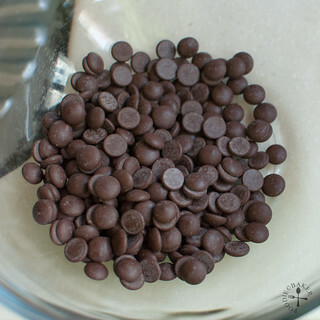 If you don’t want to use chocolate chips, you can also use a good-quality chocolate bar and chop them into bite-size pieces before mixing it into the batter. Melt the chocolate using a double boiler: Bring an inch of water to boil in a small pot. Turn the heat down to low. 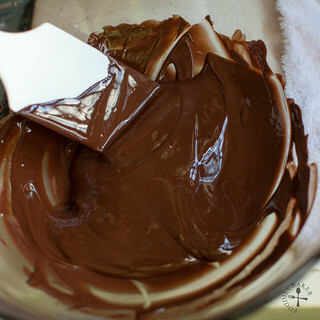 Set the bowl of chopped chocolate over the pot, making sure that the bottom of the bowl does not touch the water. Stir the chocolate occasionally until the chocolate has melted. Melt the chocolate in a microwave: Using medium power, microwave the chocolate for 30 seconds. Stir the chocolate. Microwave for another 20 seconds, stir. Finally, microwave in 10 seconds burst, stirring after each time until all the chocolate has melted. 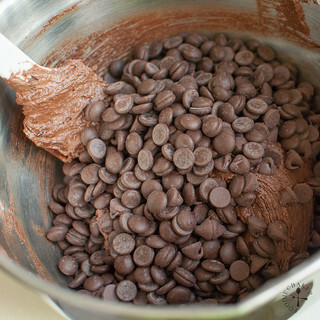 Chocolate Chips: I prefer using dark chocolate chips so they will not add too much sweetness into the cookies. If semisweet cookies are used, I would have reduced the amount of sugar used so that the overall cookie is less sweet. 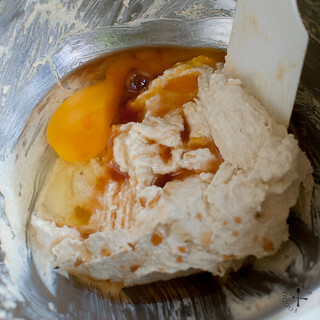 Shaping the dough: The cookie dough is pretty soft, so I prefer to scoop the dough using 2 tablespoons, refrigerate for 30 minutes until they are slightly firmer, then roll them into balls and refrigerate them again for another 30 minutes to 1 hour until they are firm before baking. You can also use an ice cream scoop to scoop the cookie dough – much easier! Making ahead: After the cookie doughs have been shaped, they can be frozen until required. Space the cookie dough 1 inch apart and freeze them for 2 hours until very firm. Transfer the cookie doughs into a ziploc bag. Stash them deep in the freezer until needed. Bake them straight without defrosting, adding a couple minutes into the baking them. Hi Kristina, the dough is quite soft and sticky so I don’t think it’s can be rolled out and stamped with a cookie cutter, unless you roll it out between 2 sheets of plastic wrap and freeze it until firm enough to be stamped out. Then again, the chocolate chips in the dough will interfere when you cut out the dough and this cookie will spread out during baking, going out-of-shape. Maybe you’d like to try another cookie recipe: https://www.foodiebaker.com/christmas-tree-cookies/ They are also by Nigella and it cuts out well. Oh my….I want them right now! They look so decadent! The melted chocolate as a filling is just irresistible. This is making me drooling, I love the melting chocolate inside the cookie, must bake for my gal too! I have baked these famous Nigella cookies too! 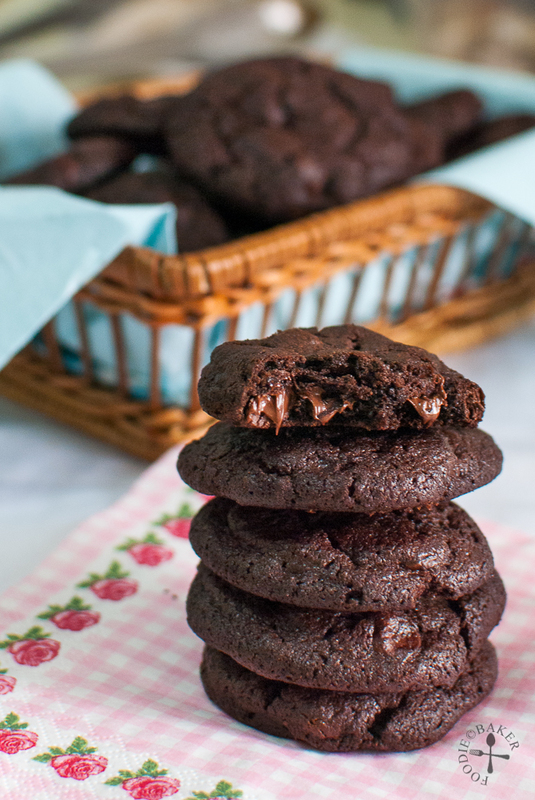 …and have baked this recipe more than once – You know… Totally agree with you that the quality of chocolate used can make so much difference in these cookies. I like to use Callebaut 70% and 54% chocolate to bake our cookies. Thanks for the cornflour tip. Would love to try that! Yum yum yum! Hi Zoe! Yay I was so excited when I see your the same recipe on your blog this morning haha. Mmmm I feel like baking these cookies again, haha! Hi Jasline , love chocolate cookies any way you make them… got milk be right over :). Oh my heavens, Jasline! I eat my cookies by moods too. Sometimes I want them chewy, sometimes crunchy always chocolate and by all means oozing chocolate too!!! Omigosh those look soooo good. Thank you! Hope you’ll try it out one day! Hi Jeannie! Hahah yes I know what you mean! My oven is so small that I can only bake 6 to 8 cookies at a time, so I have to bake a lot of batches in order to finish the cookie dough. Can’t wait to get a big oven! Oh Jasline, these look so good! I like chocolate and this will be my great pick me up in the afternoon! Jasline, I love that oozy chocolate coming out of the cookie! I prefer my cookies crispy but don’t mind if the centre is slightly soft. 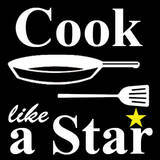 Will try this recipe very soon! Wow these cookies are to die for. Hi Edith! I think my waistline died along with the cookies some time back… haha! You’re on a yum/Nigella roll! These look fabulous! 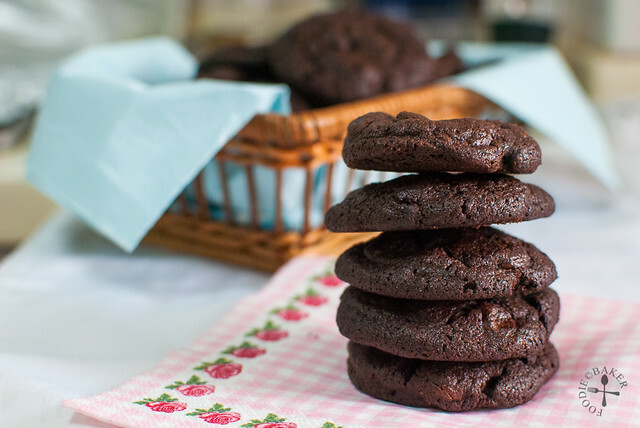 I love chocolate cookies and these look amazing! Delicious! Hi Serena, thank you very much! These look like a very serious double choc biscuits. I admire your fortitude being a baker in Singapore, it must get very hot and humid at times. Love your blog. This looks yummy! I must try to make this, its the kind of cookies my husband loves! I hope your husband will like these cookies as much as we do! Hi Ann, thank you! They will be perfect midnight snacks with a glass of milk! Hi, Jasline. I love chocolate cookies that with melted chocolate inside! I must bookmark this recipe. Hi Jasline, I would definitely a couple of this please! Love how it’s gooey in the centre. Thx for linking to LTU! Hi Baby Sumo, thank you for hosting! Would love to send some to you! Amazing cookies! Gotta love Nigella’s recipes, usually so good. I like the cornstarch idea a lot! Hi Paula! Yes Nigella’s recipes feature mainly comfort food made simple! I hope you’d try out the cookies and let me know how it goes! These are totally gorgeous looking! 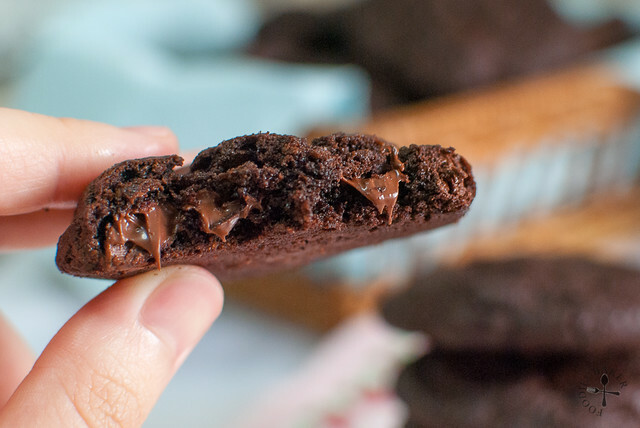 I like crispy cookies rather than chewy, but the oozing chocolate is calling out to me! LOL! A whiff of chocolate aroma, it is difficult to resist! Thanks for linking to CLAS! Hi Joyce! Oozy chocolate is always irresistible! Thank you for choosing Nigella as the theme this month, wouldn’t have found this recipe otherwise! Hi Jasline, These choc chip cookies look awesome!